Why Do my Changes Take so Long to Be Reviewed and/or Merged? Why Should I Use the Oldest Maintained Branch Instead of the Master Branch? What If I Want to Submit my Work without Fully Finishing It? Would You Accept a Huge Pull Request with Lots of Changes? Sign up for a free GitHub account, which is the service where the Symfony documentation is hosted. Be familiar with the reStructuredText markup language, which is used to write Symfony docs. Read this article for a quick overview. If you're making a relatively small change - like fixing a typo or rewording something - the easiest way to contribute is directly on GitHub! You can do this while you're reading the Symfony documentation. Step 2. Edit the contents, describe your changes and click on the Propose file change button. If everything is correct, click on the Create pull request button. Step 4. GitHub will display a new page where you can do some last-minute changes to your pull request before creating it. For simple contributions, you can safely ignore these options and just click on the Create pull request button again. Congratulations! You just created a pull request to the official Symfony documentation! The community will now review your pull request and (possibly) suggest tweaks. If your contribution is large or if you prefer to work on your own computer, keep reading this guide to learn an alternative way to send pull requests to the Symfony Documentation. In this section, you'll learn how to contribute to the Symfony documentation for the first time. The next section will explain the shorter process you'll follow in the future for every contribution after your first one. Step 1. 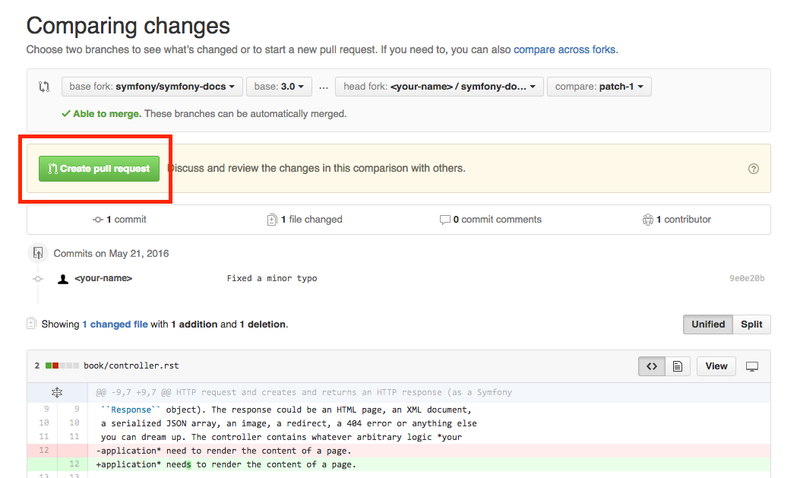 Go to the official Symfony documentation repository located at github.com/symfony/symfony-docs and click on the Fork button to fork the repository to your personal account. This is only needed the first time you contribute to Symfony. The purpose of this step is to allow you work simultaneously on the official Symfony repository and on your own fork. You'll see this in action in a moment. In this example, the name of the branch is improve_install_article and the upstream/3.4 value tells Git to create this branch based on the 3.4 branch of the upstream remote, which is the original Symfony Docs repository. Fixes should always be based on the oldest maintained branch which contains the error. Nowadays this is the 3.4 branch. If you are instead documenting a new feature, switch to the first Symfony version that included it, e.g. upstream/3.1. Not sure? That's ok! Just use the upstream/master branch. Step 5. Now make your changes in the documentation. Add, tweak, reword and even remove any content and do your best to comply with the Documentation Standards. Then commit your changes! The origin value is the name of the Git remote that corresponds to your forked repository and improve_install_article is the name of the branch you created previously. Step 7. Everything is now ready to initiate a pull request. Go to your forked repository at https://github.com/YOUR-GITHUB-USERNAME/symfony-docs and click on the Pull Requests link located in the sidebar. In this example, the base fork should be symfony/symfony-docs and the base branch should be the 3.4, which is the branch that you selected to base your changes on. The head fork should be your forked copy of symfony-docs and the compare branch should be improve_install_article, which is the name of the branch you created and where you made your changes. Step 8. The last step is to prepare the description of the pull request. A short phrase or paragraph describing the proposed changes is enough to ensure that your contribution can be reviewed. Step 9. Now that you've successfully submitted your first contribution to the Symfony documentation, go and celebrate! The documentation managers will carefully review your work in short time and they will let you know about any required change. Step 10. After your pull request is eventually accepted and merged in the Symfony documentation, you will be included in the Symfony Documentation Contributors list. Moreover, if you happen to have a SymfonyConnect profile, you will get a cool Symfony Documentation Badge. Check you out! You've made your first contribution to the Symfony documentation! Somebody throw a party! Your first contribution took a little extra time because you needed to learn a few standards and setup your computer. But from now on, your contributions will be much easier to complete. After completing your next contributions, also watch your ranking improve on the list of Symfony Documentation Contributors. You guessed right: after all this hard work, it's time to celebrate again! Every GitHub Pull Request is automatically built and deployed by SymfonyCloud on a single environment that you can access on your browser to review your changes. To access the SymfonyCloud environment URL, go to your Pull Request page on GitHub, click on the Show all checks link and finally, click on the Details link displayed for SymfonyCloud service. Only Pull Requests to maintained branches are automatically built by SymfonyCloud. Check the roadmap for maintained branches. You can now read the docs at http://127.0.0.1:8080 (if you use a virtual machine, browse its IP instead of localhost; e.g. http://192.168.99.100:8080). The generated documentation is available in the _build/html directory. Please be patient. It can take up to several days before your pull request can be fully reviewed. After merging the changes, it could take again several hours before your changes appear on the symfony.com website. Consistent with Symfony's source code, the documentation repository is split into multiple branches, corresponding to the different versions of Symfony itself. The master branch holds the documentation for the development branch of the code. Unless you're documenting a feature that was introduced after Symfony 3.4, your changes should always be based on the 3.4 branch. Documentation managers will use the necessary Git-magic to also apply your changes to all the active branches of the documentation. [WIP] (Work in Progress) is used when you are not yet finished with your pull request, but you would like it to be reviewed. The pull request won't be merged until you say it is ready. [WCM] (Waiting Code Merge) is used when you're documenting a new feature or change that hasn't been accepted yet into the core code. The pull request will not be merged until it is merged in the core code (or closed if the change is rejected). First, make sure that the changes are somewhat related. Otherwise, please create separate pull requests. Anyway, before submitting a huge change, it's probably a good idea to open an issue in the Symfony Documentation repository to ask the managers if they agree with your proposed changes. Otherwise, they could refuse your proposal after you put all that hard work into making the changes. We definitely don't want you to waste your time!